Forest City, Jalan Forest City 1, Pulau Satu, 81550 Gelang Patah, Johor Bahru, Malaysia. The city utilizes the most advanced multi-layered urban planning concept. Parks and activity spaces scatter around the city. No vehicle traverses on its ground. Railways connect the whole city. Roads, flyovers and parking space are docked on the two lower floors, separating pedestrians from vehicles. Our strong design team has created fascinating coastline with exotic landscape design. The city also surrounded by rare Mangrove Reserve, ecological wetlands and other natural resources, creating an eco-city with fresh air and pristine water. We are collaborating with Huawei, Accenture and Celcom to develop the Smart City Vision. 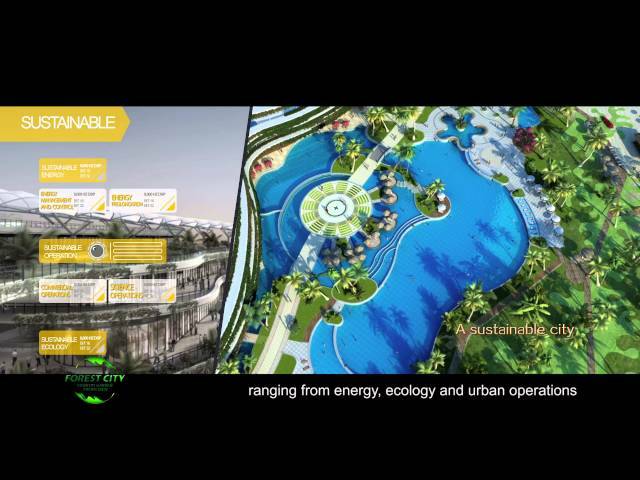 With the concept of "an integrated city", Forest City will introduce 8 keys industries, namely Tourism & MICE, Healthcare, Education & Training, Regional Headquarters, Offshore Finance, E-Commerce, Emerging Technology, and Green & smart industry. Approximately 517-1862 sq. ft high-rise apartments come with vertical greening and opulent fittings. Some of the units also come with free parking lots. Transportation Hub, international club, Harbor Commercial Street and beach park have been put into operation. Phoenix Hotel and the luxury flagship store -- SECOO are already in soft operation. Country Garden, One of Forbes' Top 500 Public Companies, has developed more than 500 high-quality projects and served over 3 million home owners globally. We cooperate with EDSB, SASAKI, Arup, G-Energy Global, Shattuck-St. Mary's School and various top multinational corporations to shape a prime model of future city. MOU has been signed with MJ Group - a top healthcare institute in Asia. We are also seeking for cooperation with various world-class hospitals, medical service and research organizations, with aims to provide world-class medical services to our residents. Contract has been signed with Shattuck-St Mary's School, a renowned private boarding school in United States, with aims to offer international education from kindergarten to high school. The school is expected to open in August, 2018. Forest City is also collaborating with Iskandar Malaysia authorities to establish research centers, technical training institutions and etc. The close-off management system in the whole island is equipped with a smart security system and property services similar to five-star hotels, creating the most secure and enjoyable city. We adopt an elevator IC card and management system similar to and five star hotel. Each card allows the card users to access their designated floors, ensuring the safety of our residents.